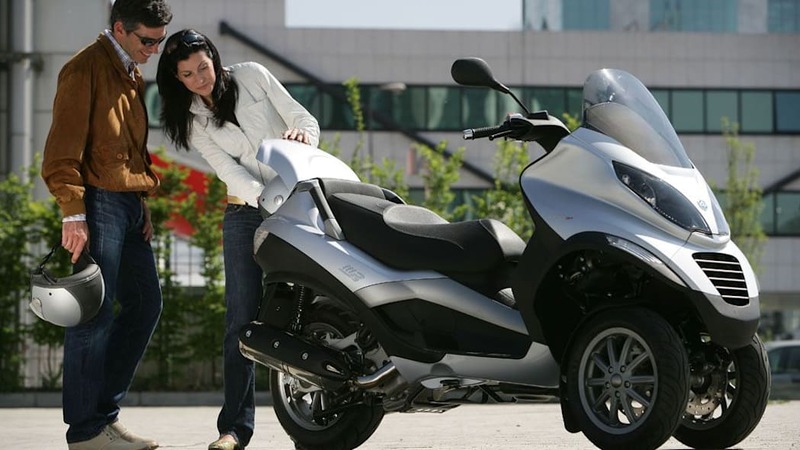 Way back in 2006, Piaggio invented a new category in motorcycling: the three-wheeled leaning scooter. 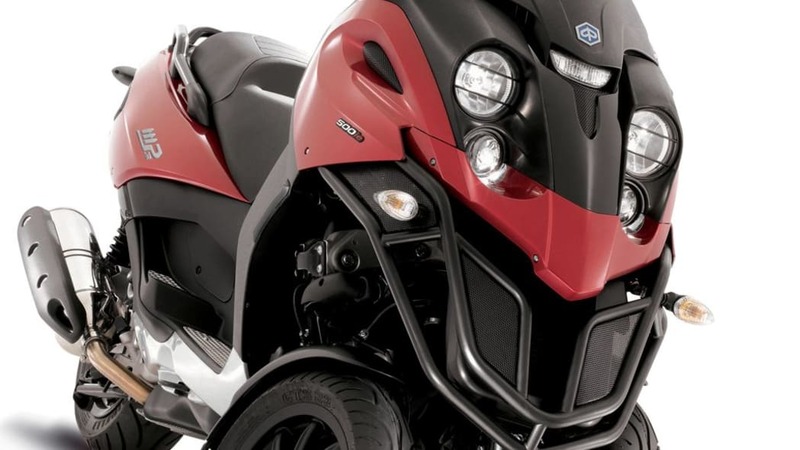 It turns out that they were really on to something - the MP3 has been selling so well that Piaggio has decided to introduce two new versions of the machine to the American market. 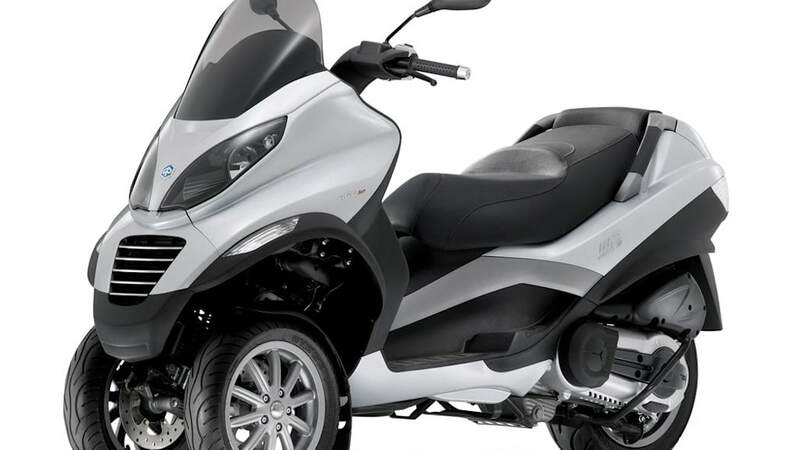 Joining the original 250cc MP3, Piaggio has officially announced their plans to release both a 400cc version and a 500cc version. With 34 horsepower, the 400 offers a useful increase in power to the original MP3, but we're more interested in the 500. Boasting 40 horsepower, the MP3 500 is capable of about 90 miles per hour. 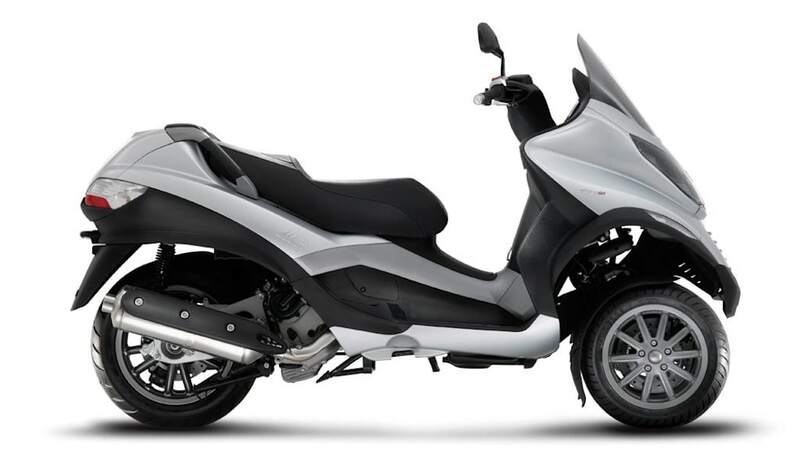 We also prefer the Mad Max ready-for-anything look of the 500 to the swoopy plastic look of the 250 and 400. 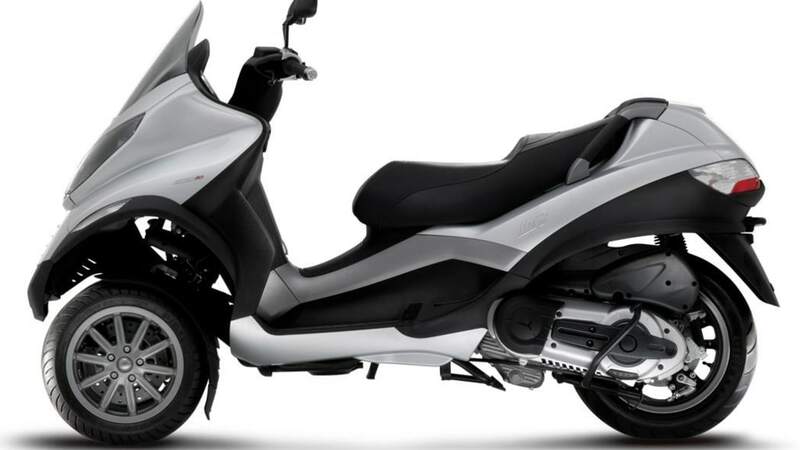 A Ducati it's not, but if your Italian cycling passion is a bit more rational, Piaggio may have exactly what you are looking for. 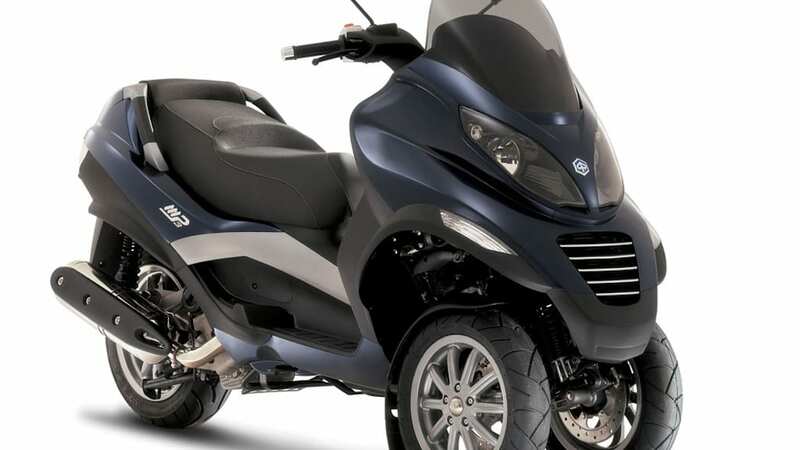 NEW YORK, January 31, 2008 – Italian manufacturer Piaggio launched a revolution in the personal transportation category when it rewrote the rules with the three-wheel MP3 250 scooter. 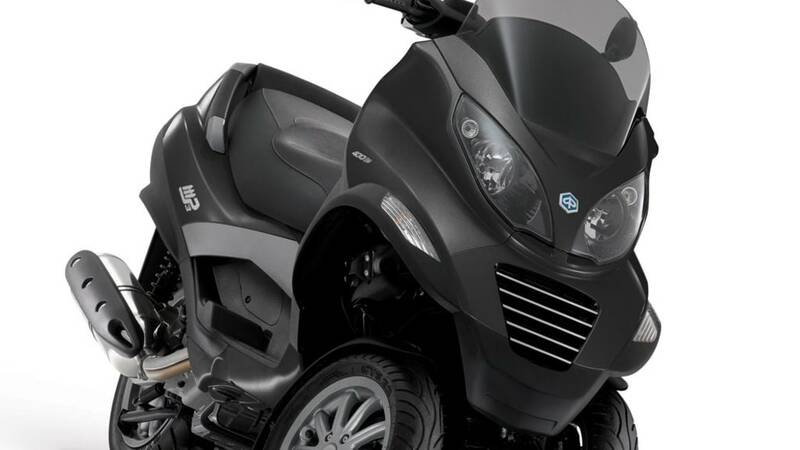 For 2008, the company again raises the bar with the introduction of two all-new MP3 models, the MP3 500 and MP3 400 maxi scooters. Based on the trademark technical innovations that transformed the MP3 250 into an immediate best-seller, the higher-displacement MP3 500 and 400 offer riders the added benefit of high-performance four-stroke engines, aggressive styling and a new level of premium safety, comfort and convenience equipment. Designed to go the distance, the newest MP3 models are uniquely suited to enjoying the diverse terrain of America's highways and byways. 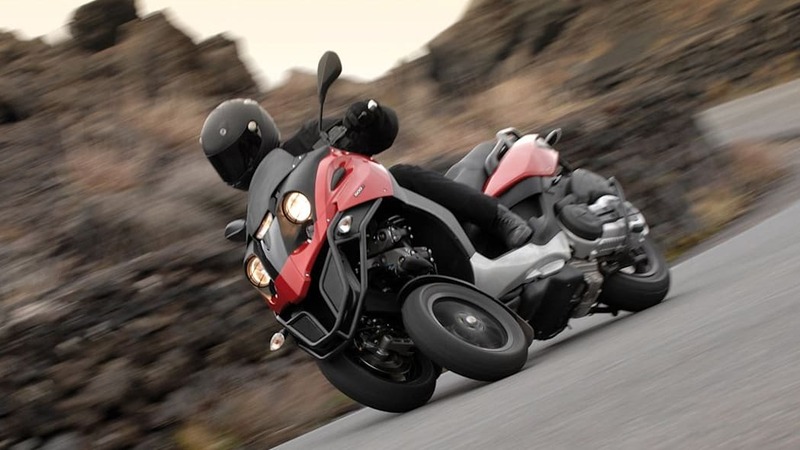 All MP3 models feature Piaggio's innovative three-wheel configuration. Unique in the category, each MP3 delivers unparalleled stability, road grip and parking ease thanks to two independent tilting, articulated front wheels and an electro-hydraulic suspension locking system that allows the scooter to remain locked upright while at a standstill. 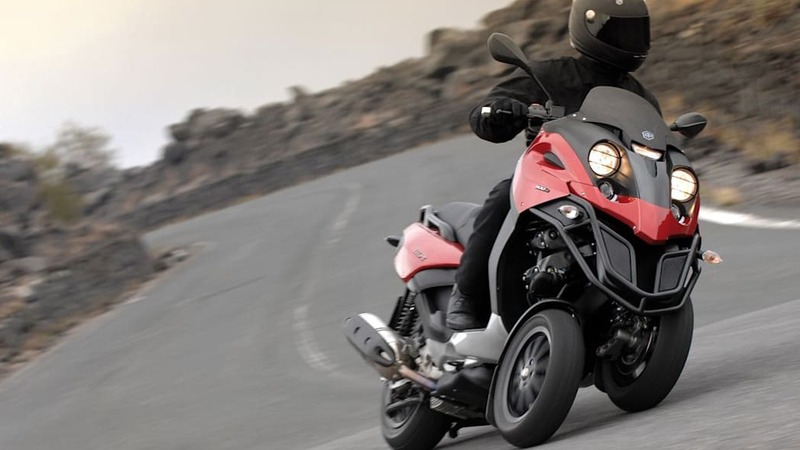 At the same time, the MP3 sacrifices nothing when it comes to riding thrills – with a 40-degree lean angle, every MP3 delivers all the maneuverability, agility and entertainment of a motorcycle. Dry or wet conditions, smooth asphalt highway or pot-hole studded city streets, the MP3 models are resilient travel companions. 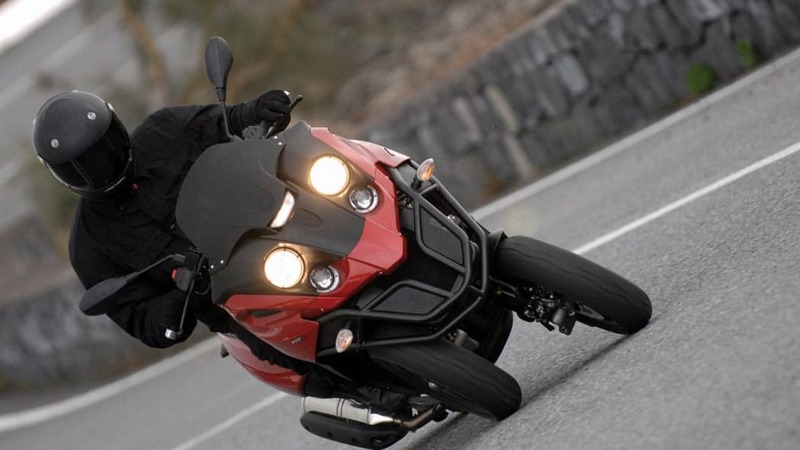 Whether effortlessly carving through a set of twisties or confidently navigating pockmarked urban terrain, the 2008 MP3 500 is the personal transportation choice most likely to get your adrenaline into high-rev mode. Distinguished by top-of-the-line performance and aggressive styling, the MP3 500 has the strongest appetite for aggressive riding of the three available models. Even standing still, the MP3 500 looks ready for action. 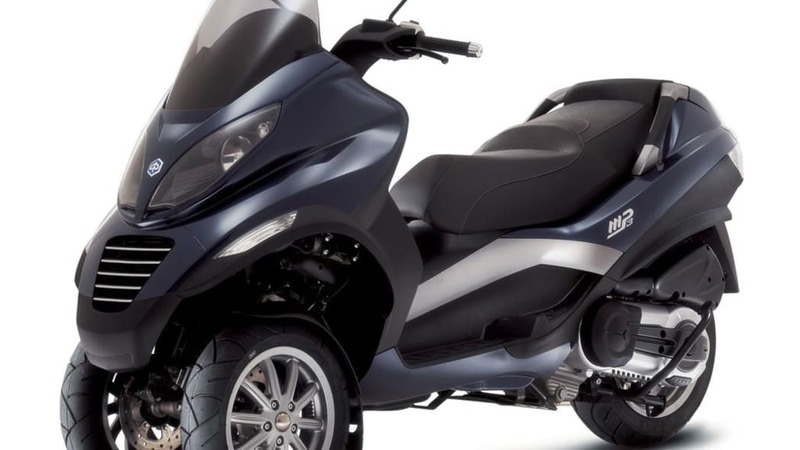 A double steel tube bumper with metal mesh inserts give the vehicle a rugged look, as do a sleek black metal handlebar and black ten-spoke wheel rims. 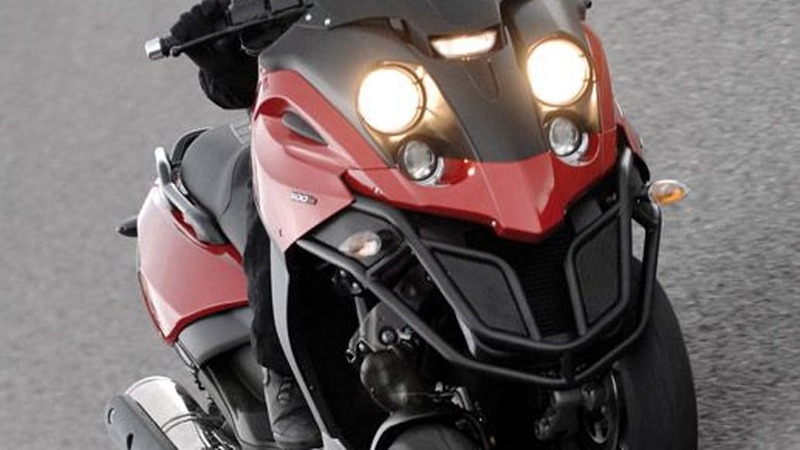 A five-lamp headlight unit is not only visually striking, but highly functional – the two biggest head lamps are equipped with off-road-style shockproof covers. But, despite its race-inspired design, the MP3 500 doesn't skimp on rider comfort. From an aerodynamically efficient front fairing to a wide, comfortable footrest panel, generous seat and handy rear rack, the MP3 500 offers total riding comfort to both the rider and passenger. At the heart of the MP3 500's performance is a liquid-cooled, electronically-injected 492.7cc four-stroke powerplant with peak horsepower of 40 hp at 7,250 rpms. The MP3 500's torque curve is ideal for strong, smooth acceleration with plenty of power available at low and mid-range revs. A peak 31.12 ft.-lb. of torque is available at 5,550 rpm. 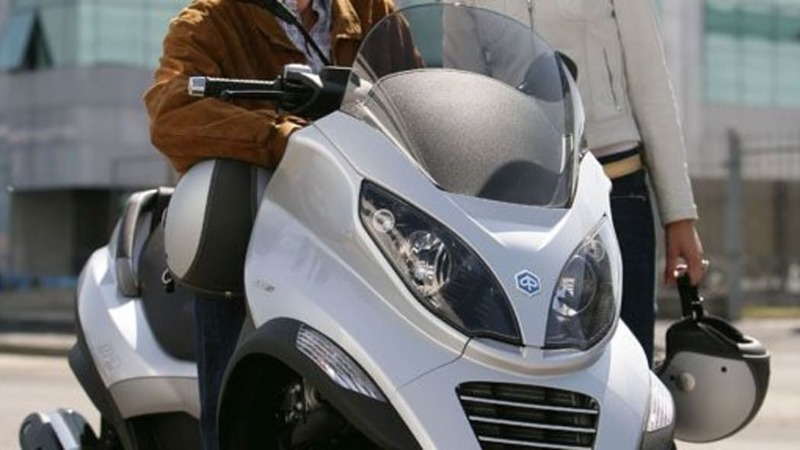 With a top speed of 89 mph, this maxi scooter is ready to go – but it will do so with minimum noise and reduced emissions, thanks to its twin spark system. Strong performance potential depends on an equally strong chassis and superior brakes and the MP3 meets all the criteria. The MP3's innovative parallelogram front suspension technology provides category-leading stability and impeccable road holding, while large 240 mm triple steel disk brakes ensure fast stopping power. 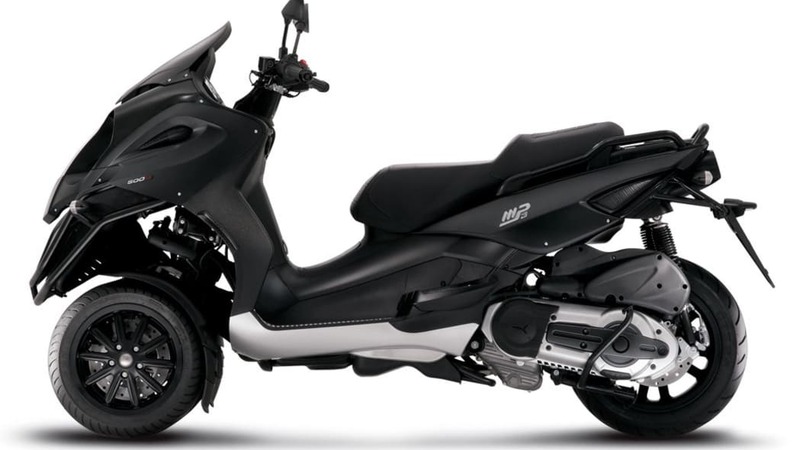 The MP3 requires 20% less braking distance than best-in-class two-wheel scooters. The 2008 MP3 500 is available for a manufacturer's suggested retail price (MSRP) of $8,899. Color choices include Passion Red and Demon Black. A full range of travel and security accessories, including a Tom-Tom satellite navigation system, are available. Train tracks, rough road, miles of slick pavement, parking on steep hill – bring it on. The 2008 MP3 400 is the maxi scooter of choice for anyone who believes that personal transportation should be flexible enough to handle short jaunts, high-traffic commutes and long, leisurely rides with equal aplomb. 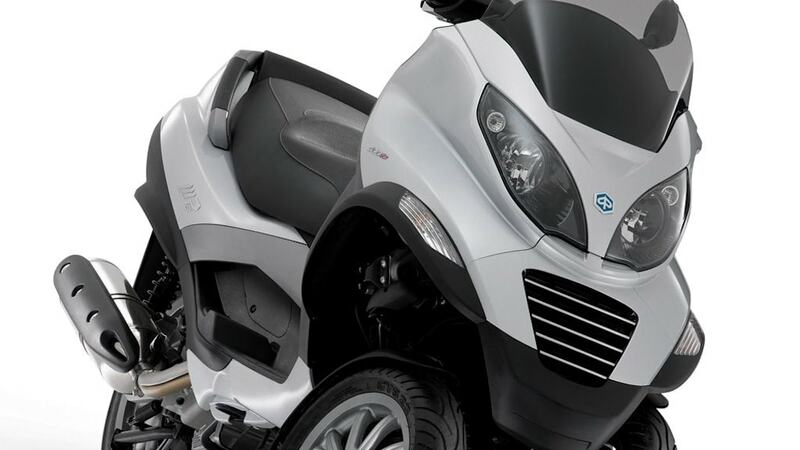 Because the MP3 400 has been designed to meet the everyday needs of owners, every element of the scooter has been maximized for rider comfort, safety and convenience. Storage onboard is plentiful, including an exceptionally large underseat storage bay that can hold up to two full-face helmets. 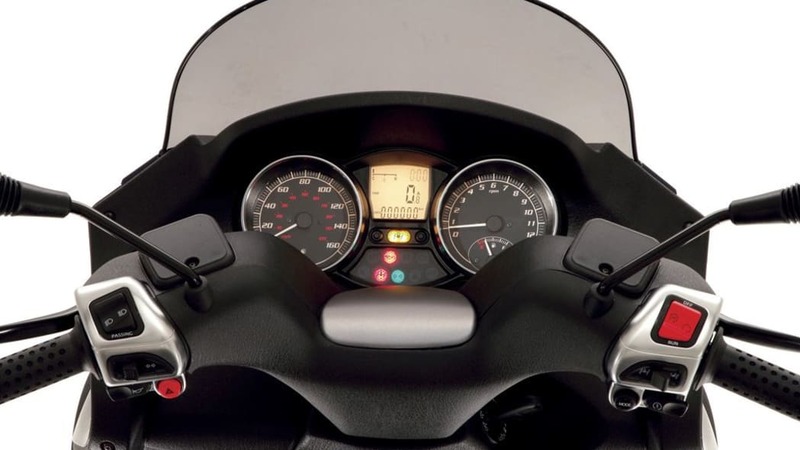 Add any number of accessories, such as a roomy top box, tall windscreen or Tom-Tom Navigation and the MP3 400 serves virtually any riding purpose. When you consider power, convenience, safety, fuel economy and fun, there is no doubt the MP3 400 is the ultimate commuting vehicle. The MP3 400s excellent performance begins with its 398.9ccc liquid-cooled, electronically injected four-stroke powerplant. The four-valve single puts out a maximum of 34 hp at 7,500 rpm, with peak torque of 27.3 ft.-lb. at just 5,000 rpm. With power and torque fully available at low revs, accelerating and passing are a breeze. 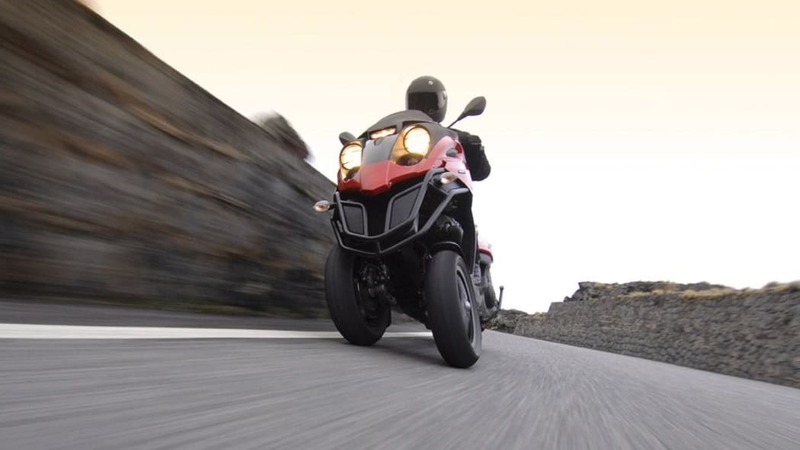 While the MP3 400 is happy to chew up highway miles all day long, there's always quick burst of power on tap for sporty maneuvers in challenging traffic conditions. Thanks to the new engine and a large 14-inch rear wheel, the MP3 400 has a 65mm longer wheelbase than the MP3 250 for superior stability in fast curves or during hard braking. 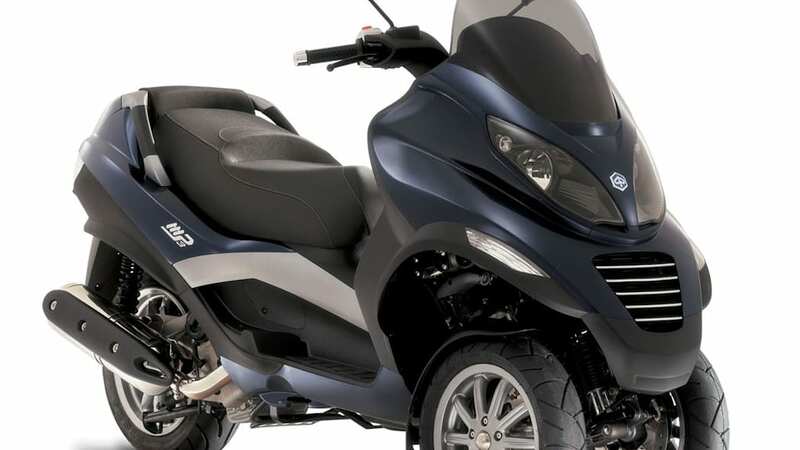 Like its MP3 siblings, the MP3 400's innovative character comes from the original Piaggio parallelogram suspension design. The unique tilt mechanism that allows the two front wheels to function independently is composed of four cast aluminum arms, with four hinges fixed to the central tube. Two guide tubes are on either side of the parallelogram, connected to the arms via suspension pins and ball bearings. The 2008 MP3 400 is available for a manufacturer's suggested retail price (MSRP) of $8,699. Color choices include Cortina Gray and Midnight Blue. 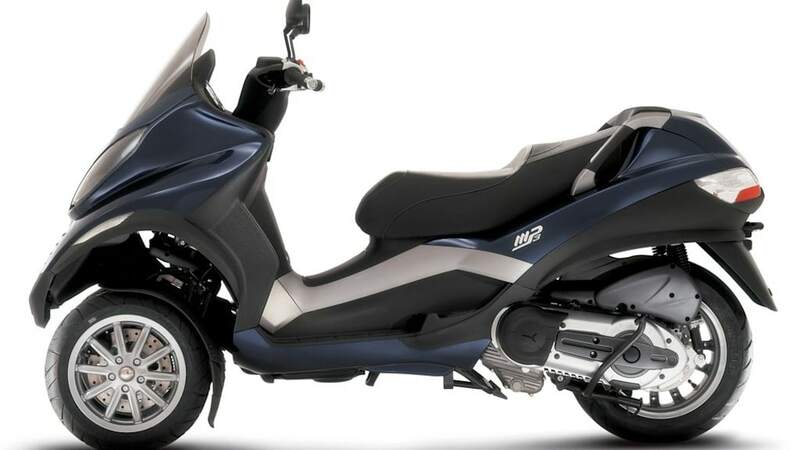 With the world debut of the MP3 250 in 2006, Piaggio served notice that a new era in personal transportation had just begun, thanks to the three-wheel scooter's uniquely functional and fun character. 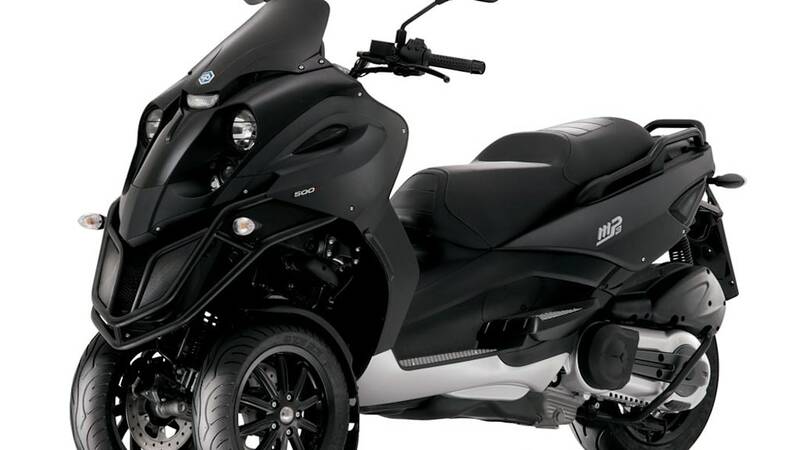 Designed to be the easiest to own and ride scooter ever, the MP3 250 also adds plenty of performance, safety and convenience features to the mix. There's no mistaking the MP3 250 on the road. 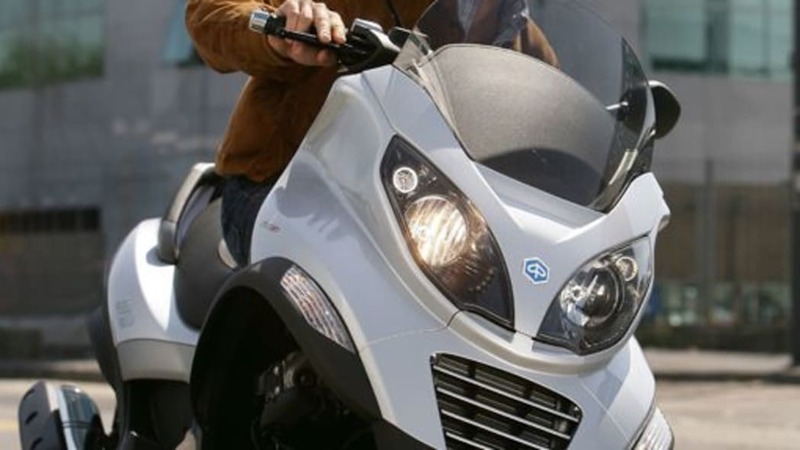 Aerodynamically superb thanks to extensive wind tunnel testing and inspired by the sporty Piaggio GT line, the MP3 is compact and sleek. 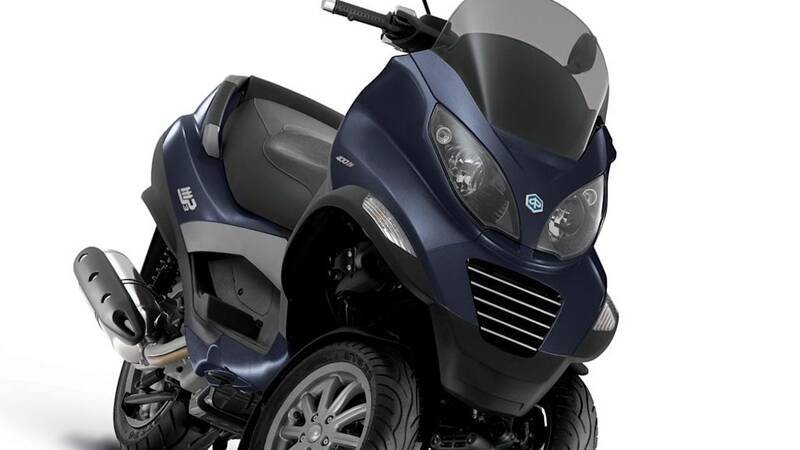 While three 12-inch wheels provide the ultimate stability and road grip, Piaggio's original suspension design and tilt mechanism give the MP3 250 all the agility of a traditional two-wheel machine. MP3 250 riders enjoy a premium level of protection and generous storage space for category leading fun and functionality. Shock-resistant splashguards on either side of the front shield keep road debris and the elements at bay. Underseat storage holds up to two full-face helmets and items up to 3 feet in length. It can also be accessed from the rear for added convenience. Riding the MP3 is a thrill and parking it is a cinch. Thanks to its compact size, the MP3 250 fits into the smallest of spaces and its articulated front wheels mean that one wheel can be placed up to 7.8 inches higher than the other. 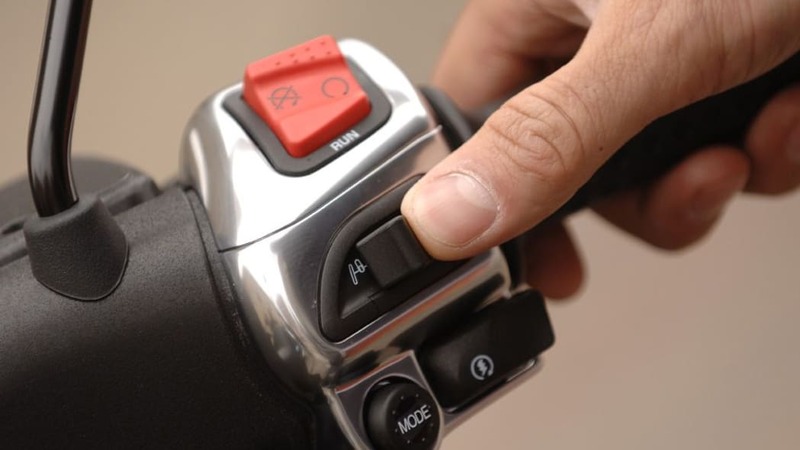 Like all the MP3s, a quick flick of the handlebar switch activates the system the patented electro-hydraulic front suspension locking system that keeps the MP3 250 upright without using a center stand. The 2008 MP3 250 is available for a manufacturer's suggested retail price (MSRP) of $7,199. Color choices include Passion Red and Graphite Black. 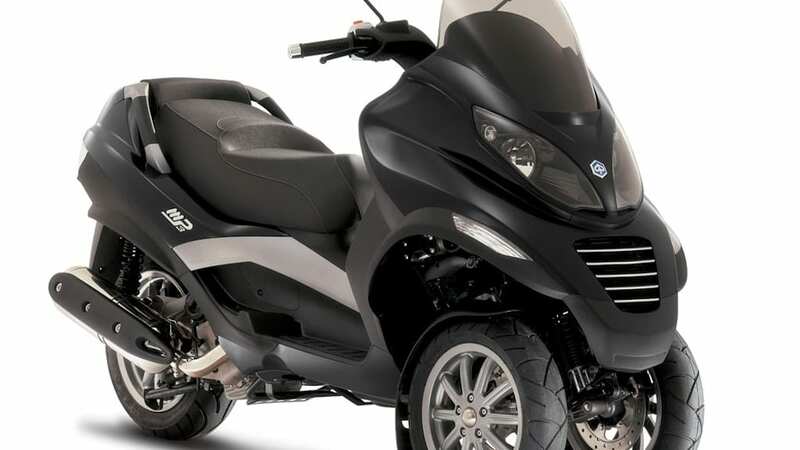 With over 6,700 employees, an annual production of more than 680,000 vehicles in 2006, 5 R&D centers, 7 production facilities in Europe and Asia, and operations in over 50 countries, the Piaggio Group has a consolidated leadership in the European 2 wheeler market. 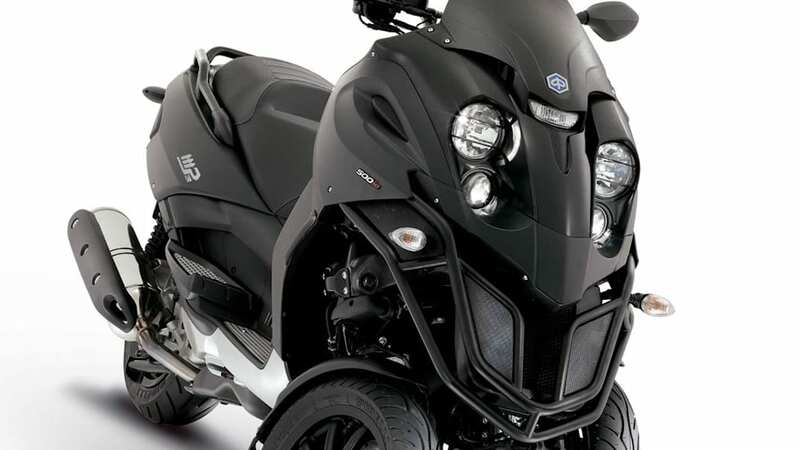 Its production includes scooters, motorcycles and mopeds in the 50cc to 1,200 cc displacement range, marketed under the Piaggio, Vespa, Gilera, Derbi, Aprilia, Scarabeo and Moto Guzzi brands.